Enjoy healthy low fat burgers and sausages. 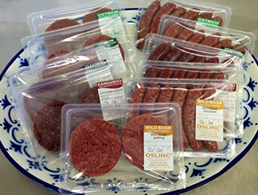 This selection pack includes; Buffalo, Kangaroo, Ostrich, Venison & Wild Boar. 10 Gourmet Burgers and 30 Gourmet Sausages. Pack includes; 30 Gourmet Sausages and 10 Gourmet Burgers all homemade in our farm butchery. Sausages – 6 Kangaroo, 6 Ostrich, 6 Ostrich & Tomato, 6 Venison Apple & Cranberry & 6 Wild Boar. Burgers - 2 Kangaroo, 2 Ostrich, 2 Venison, 2 Wild Boar & Apple and 2 Buffalo. Supplied fresh and suitable for home freezing.